How do you make a glass snail shell the size of a beach ball complete with internal coils true to life? That was the self-imposed challenge for Annie Dunning, Guelph installation artist and this year’s artist-in-residence in U of G’s School of Environmental Sciences (SES). She didn’t have to go far for help. Normally, SES professor Richard Heck uses X-ray imaging equipment in his Alexander Hall lab to study soil samples. When Dunning brought him a real-life snail shell collected near her parents’ home in the Ottawa Valley, it was easy enough for Heck to scan and provide X-ray images of its internal helical structure. That kind of art-science crossover is part of the goal of her novel residency at U of G.
Dunning is the third artist-in-residence with SES, following year-long stints by installation artists Julie René de Cotret from Guelph and Toronto’s Robert Hengeveld. The school established the program in 2009. 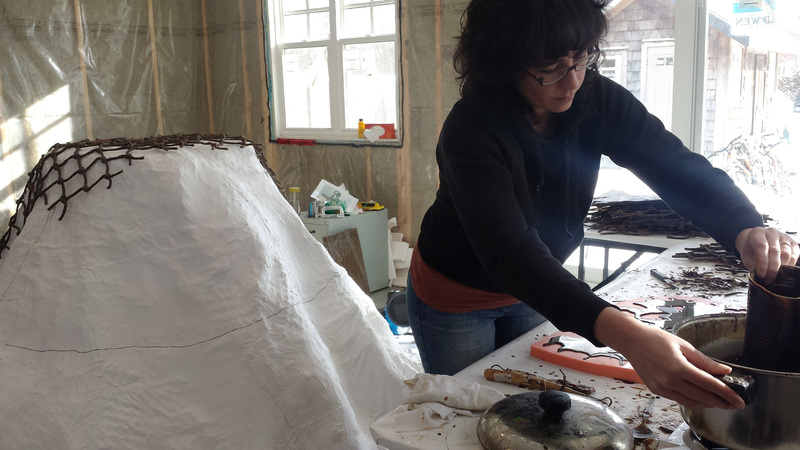 A mixed-media artist, Dunning has nearly completed her installation called Cochlea. The piece will consist of two parts, including a glass shell replica being cast by Toronto glass artist Kasia Czarnota. The shell will perch at head height atop a wave-form mesh net that Dunning plans to cast from aluminum. By early January, the net’s plaster mould — resembling a chest-high mountain — occupied much of the floor space in her studio. She plans to display Cochlea this spring at the Kitchener-Waterloo Art Gallery in a show called Echo/Locations. Through the piece, she’s exploring sound. A microphone installed in the shell will collect ambient noises — voices, footsteps — to be amplified and broadcast through speakers in the gallery. More generally, she says, the project is intended to explore our connections with the natural world. That theme resonates through much of her installation work since her undergrad at Mount Allison University in New Brunswick in 1997. Her master’s degree at Guelph a decade later combined pigeons and flutes to explore recorded sound. For a solo show called Sapsucker Sounds last year at the Klondike Institute of Art and Culture in Dawson City, Yukon, she made a turntable that interpreted woodpecker holes on a found log as a kind of recording. Under her residency, which began in early 2015, Dunning has discussed work with other researchers in SES and in the Department of Plant Agriculture. Earlier, Heck used equipment in the micropedology lab to scan a fossil shell for a paleontologist. Since 2013, Dunning has also occupied a studio at Boarding House Arts in downtown Guelph. There she is one of a number of emerging artists working under an incubator program co-sponsored by U of G’s School of Fine Art and Music.